Goldapple-alu aluminum extrusion suppliers explain six key points of aluminum profile mold design. The size and deviation of the extrusion are determined by the mold, extrusion equipment and other relevant process factors. Among them, the influence of mold size change is great, and the reasons for the change of mold size are: elastic deformation of the mold, temperature rise of the mold, material of the mold, manufacturing precision of the mold and wear of the mold. The extrusion ratio is a numerical value indicating the ease with which the mold can be extruded. Generally, an extrusion ratio of 10 to 150 is applicable. If the extrusion ratio is lower than 10, the mechanical properties of the product are low; on the contrary, if the extrusion ratio is too high, the product is prone to defects such as surface roughness or angular deviation. Solid profiles are often recommended for extrusion ratios of around 30 and hollow profiles of around 45. The outer dimensions of the extrusion die refer to the outer diameter and thickness of the die. The overall dimensions of the mold are determined by the size, weight and strength of the section of the profile. When aluminum extrusion manufacturers are calculating the die whole size, the chemical composition of the extruded aluminum alloy, the shape of the product, the nominal size and the allowable tolerance, the extrusion temperature, and the linear expansion coefficient of the die material and the extruded alloy at this temperature are mainly considered. The characteristics of the geometric shape on the section, its variation in the straightening of the stretch, the magnitude of the pressing force and the elastic deformation of the mold. For profiles with large wall thickness differences, the thin-walled parts and the sharp-pointed corners that are difficult to form should be appropriately enlarged. The so-called reasonable adjustment is to ensure that each particle point on the section of the product should flow out of the die hole at the same speed under ideal conditions. Try to use a porous symmetrical arrangement. According to the shape of the profile, the difference in wall thickness of each part and the difference in circumference and the distance from the center of the extrusion tube, the sizing belts of unequal length are designed. In general, the thinner the wall thickness of a part of the profile, the larger the circumference, the more complex the shape, and the farther away from the center of the extrusion cylinder, the shorter the sizing belt here. Mold strength is a very important issue in mold design due to the harsh working conditions of the mold during extrusion. In addition to the proper placement of the die holes, the selection of suitable mold materials, and the design of a reasonable mold structure and shape, it is also important to accurately calculate the extrusion force and check the allowable strength of each dangerous section. As for the check of the strength of the mold, it should be carried out separately according to the type of the product, the structure of the mold, and the like. Generally, the flat mold only needs to check the shear strength and the bending strength; the tongue mold and the plane split mold need to check the shear, bending and compressive strength, and the tensile strength of the tongue and the needle tip need to be considered. Determining the working belt of the split-combined mold is much more complicated than determining the half-mold working belt, not only considering the difference in wall thickness of the profile, the distance from the center, but also considering that the die hole is covered by the splitter bridge. The die hole under the shunt bridge must be thinned due to the difficulty of metal flow. When determining the working belt, first find out where the wall thickness of the profile under the shunt bridge is thin, that is, where the metal flow resistance is large. The smaller working belt here is set to twice the wall thickness, and the wall thickness is thick or metal. Where it is easy to reach, the work belt should be properly considered for thickening, generally in a certain proportional relationship, plus the correction value of easy flow. 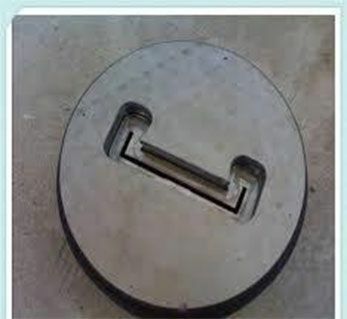 The die hole empty cutter is the structure of the cantilever support at the outlet end of the die hole working belt. When the wall thickness of the profile is t≥2.0mm, a straight air knife structure with easy processing can be used; when t<2mm, or with a cantilever, a slanting knife can be used.